The Floral Genome Project was initiated to bridge the genomic gap between the most broadly studied plant model systems. Arabidopsis and rice, although now completely sequenced and under intensive comparative genomic investigation, are separated by at least 125 million years of evolutionary time, and cannot in isolation provide a comprehensive perspective on structural and functional aspects of flowering plant genome dynamics. Here we discuss new genomic resources available to the scientific community, comprising cDNA libraries and Expressed Sequence Tag (EST) sequences for a suite of phylogenetically basal angiosperms specifically selected to bridge the evolutionary gaps between model plants and provide insights into gene content and genome structure in the earliest flowering plants. Random sequencing of cDNAs from representatives of phylogenetically important eudicot, non-grass monocot, and gymnosperm lineages has so far (as of 12/1/04) generated 70,514 ESTs and 48,170 assembled unigenes. Efficient sorting of EST sequences into putative gene families based on whole Arabidopsis/rice proteome comparison has permitted ready identification of cDNA clones for finished sequencing. Preliminarily, (i) proportions of functional categories among sequenced floral genes seem representative of the entire Arabidopsis transcriptome, (ii) many known floral gene homologues have been captured, and (iii) phylogenetic analyses of ESTs are providing new insights into the process of gene family evolution in relation to the origin and diversification of the angiosperms. Initial comparisons illustrate the utility of the EST data sets toward discovery of the basic floral transcriptome. These first findings also afford the opportunity to address a number of conspicuous evolutionary genomic questions, including reproductive organ transcriptome overlap between angiosperms and gymnosperms, genome-wide duplication history, lineage-specific gene duplication and functional divergence, and analyses of adaptive molecular evolution. Since not all genes in the floral transcriptome will be associated with flowering, these EST resources will also be of interest to plant scientists working on other functions, such as photosynthesis, signal transduction, and metabolic pathways. The genome sequences of Arabidopsis  and rice [2, 3] have stimulated great advances throughout the plant sciences. Comparisons of these eudicot and monocot genomes have provided many insights into the genome characteristics and evolutionary histories of both lineages [e.g. [4–6]], and comparisons involving additional species are generating a more global picture of angiosperm genome evolution [7–9]. These multispecies comparisons, and comparative plant sciences more generally, have been aided by the well-supported understanding of evolutionary relationships among flowering plants that has emerged over the last decade [e.g. [10–13]]. Among the most noteworthy phylogenetic results is the well-supported inference that whereas monocots form a clade, the dicots as traditionally circumscribed do not. Rather, monocots are derived from within the "primitive" dicot grade, now collectively referred to as basal angiosperms (Fig. 1). The "eudicots" (or "tricolpates" ; Fig. 1) do form a clade that comprises ca. 75% of all angiosperm species , and most of this diversity is found among the "core" eudicots, which include the rosids, asterids, and Caryophyllales (Fig. 1). Model systems such as Arabidopsis thaliana, tomato (Lycopersicon esculentum), cotton (Gossypium), poplar (Populus), barrel medic (Medicago truncatula) and ice-plant (Mesembryanthemum crystallinum), are all representatives of the core eudicot clade (Fig. 1). Rice (Oryza savita), maize (Zea mays), wheat (Triticum aestivum), barley (Hordeum vulgare), sorghum (Sorghum bicolor), and sugarcane (Saccharum officinale) are all members of the grass family (Poaceae), a phylogenetically derived lineage within the monocots (Fig. 1). Although comparisons of the rice and Arabidopsis genomes will undoubtedly identify many features of the ancestral angiosperm genome, this pair-wise comparison alone will not be able to distinguish Arabidopsis-specific attributes from those specifically absent in rice or visa versa. The recent posting of high coverage genome sequence for Populus trichocarpa  is a major advance for comparative plant genomics, but even Populus-Arabidopsis-rice comparisons cannot distinguish features common to all angiosperms from those that arose in the most recent common ancestor of eudicots and monocots, which existed at least 125 million years ago  and perhaps more than 140 million years ago [e.g. [18–20]]. In general, the resolving power of comparative plant genomics will increase with additional taxa representing key lineages in plant phylogeny (Fig. 1). Increased genomic resources for phylogenetically diverse plant species will lead to a better understanding of plant genome evolution, the diversification of gene families, and the origins of reproductive characteristics common to all flowering plants. Well- supported evolutionary relationships among FGP species and other genomic models are shown in this phylogenic tree of seed plants. Red taxon names indicate those species for which we aim to sequence 10,000 ESTs, green taxon names indicate species for which we are sequencing 2000 ESTs, and blue taxon names indicate species for which large EST sets are already available in public databases [24, 25, 28, 29, 61] or will soon become available . Basal angiosperms and basal eudicots (e.g., Ranunculales), while comprising a small percentage of the total number of extant angiosperm species, nonetheless encompass an astonishing spectrum of developmental patterns and floral forms [21, 22]. In turn, this diversity provides a clear opportunity to reconstruct to the basal condition of angiosperms, and thereby bridge the evolutionary gap between model eudicot and monocot genomes. Understanding the evolution of angiosperm genes and genomes, including the floral transcriptome, requires three-way and higher-order comparisons that extend beyond Arabidopsis and rice. This point is widely appreciated, and comparative plant genomics is being fueled by the availability of genomic resources for a growing number of plant species. The addition of species representing basal angiosperms, basal eudicot, and non-grass monocot lineages will be especially valuable, not only for flowering research, but also for more general "reconstructomic" studies of housekeeping and transcription factor functions. A primary objective of the Floral Genome Project (FGP; ) is to uncover patterns of conservation and divergence of the floral transcriptome among angiosperms, particularly to elucidate the role of gene duplications and shifting expression patterns in the origin and diversification of angiosperms. The FGP has constructed a large collection of non-normalized nor tissue subtracted cDNA libraries and 5' EST sets from developing reproductive tissues for selected species of basal eudicots, basal angiosperms and gymnosperms (Table 1). These species represent not only key nodes in the angiosperm phylogenetic tree and its sister group (gymnosperms), but also a diversity of reproductive structures and developmental patterns. While multi-species comparisons of large sequence data sets are already possible for Poaceae [9, 24] Solanaceae , and Brassicaceae [7, 26, 27], the addition of large EST sets for basal angiosperms opens the door to fundamental comparative genomics investigations of the origin and diversification of flowering plants. Current (12/01/04) statistics for Floral Genome Project cDNA libraries, EST sequences and unigene builds. We will perform 10,000 EST sequencing reactions for each taxon listed in the top portion of the table and 2000 ESTs for each taxon in the bottom portion of the table. Acorus americanus (Sweet flag) – Basal monocot. m indicates library constructed from male tissues; f for female tissues. a Unigene numbers are shown in the first line for taxa with multiple libraries. bObserved redundancy was measured for each taxon as (EST# – Unigene #)/Unigene#. c5188 ESTs from the male Asparagus library were sequenced in collaboration with Mike Havey (University of Wisconsin) and Chris Town (TIGR). eVaccinium young inflorescence library was provided by Jeannine Rowland (USDA) . Random 5' sequencing of cDNAs from basal flowering plants has so far (as of 12/01/04) generated 70,514 ESTs assembled into 48,170 unique gene sequences (Table 1). These materials should provide essential resources for comparative genomic research because they represent previously poorly sampled genomes placed at crucial points in angiosperm phylogeny. Gene sequences from the gymnosperm Welwitschia, the basalmost angiosperms Amborella and Nuphar, the basal monocot Acorus, the magnoliids Persea, Liriodendron and Saruma, and the basal eudicot Eschscholzia will aid in placing boundary dates on the origins of florally-expressed gene families, help resolve patterns of gene and genome evolution within the flowering plants, and bridge critical gaps in comparative analyses involving monocot and eudicot model systems. Identification of cDNA clones for finished sequencing has been aided by efficient sorting of EST sequences into putative gene families based on whole Arabidopsis/rice proteome comparison. Phylogenetic analyses of ESTs are providing new insights into the process of gene family evolution in relation to the origin and diversification of the angiosperms. Here we introduce our EST database and provide some examples of broad utility of these data in comparative analyses. All FGP EST data and unigene builds are available through the Plant Genome Network (PGN) website , linked also through the FGP homepage . PGN was designed as a general-purpose EST analysis pipeline and web-based database that can be readily employed as a "front end" for other EST sequencing projects. PGN is a trace file database accepting all standard automated sequencer file formats. Quality information in the raw trace files is used for sequence trimming and assembly, and chromatograms can be visualized through the website. The focus on trace file data distinguishes PGN from other EST databases such as PlantGDB  and the TIGR Gene Indices . PGN also provides an EST processing and annotation service for smaller EST projects that may not have the informatics resources to generate a public database, and provides a stable web address for these projects. PGN provides public access to EST library statistics, unigene build details, EST chromatograms, and permits FGP taxon-specific BLAST  searches. Tentative classification of unigenes has allowed us to identify quickly the genes represented in our EST sets. We created an objectively defined scaffold for classification through cluster analysis of the Arabidopsis and rice proteomes. The PlantTribes database  can be searched using BLAST, or by query with Arabidopsis or rice sequence IDs , sequence annotations, Pfam accession IDs  or keywords. To construct PlantTribes, predicted protein sequences from the Arabidopsis thaliana var. Columbia and Oryza sativa var. japonica (rice) genomes were downloaded from TIGR . The BLASTP program  was used to compare all sequences to each other, and the similarity-based clustering procedure TribeMCL [36, 37] was used to group proteins into putative gene families within our PlantTribes database. Of the 20,992 tribes identified by MCL cluster analysis of the Arabidopsis and rice proteomes, 60 PlantTribes included at least one of 100 known floral development regulators (Tables 2 and 3). Number of FGP unigenes that are best BLAST hits to Arabidopsis floral developmental regulation genes, with corresponding tribe ID number and number of Arabidopsis and rice genes in these tribes. Species IDs: Aam, Acorus americanus; Aof, Asparagus officinalis; Ath, Arabidopsis thaliana; Atr, Amborella trichopoda; Eca, Eschscholzia californica; Ltu, Liriodendron tulipifera; Nad, Nuphar advena; Osa, Oryza savita; Pam, Persea americanus; She, Saruma henryi; Wmi, Welwitschia mirabilis. aTribe ID's are reference numbers for the PlantTribes database . 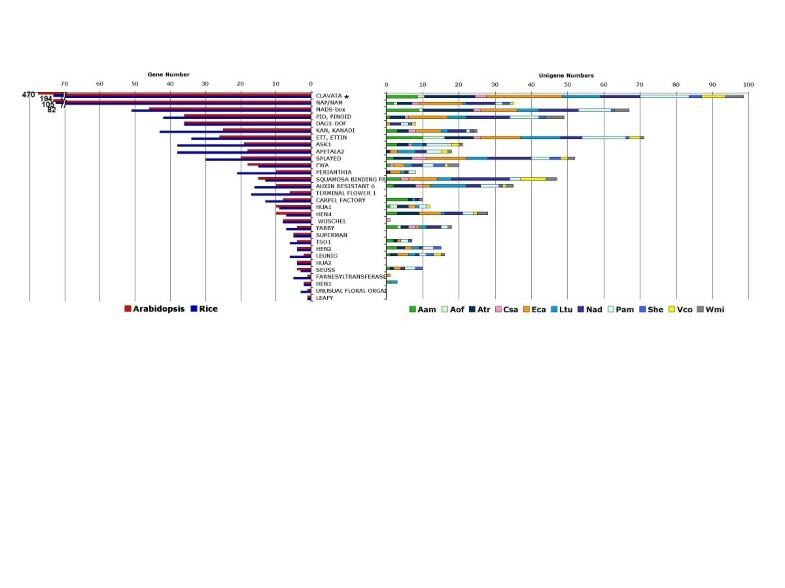 bGene family size is represented by the number of rice (osa) and Arabidopsis (ath) genes in each medium stringency tribe. To estimate the complexity of the non-normalized nor tissue subtracted FGP cDNA libraries and the underlying floral transcriptomes, we analyzed predicted functions of the FGP unigenes. Overall, functional classification of FGP unigene assemblies shows that EST sequencing has captured a nearly uniform representation of the sampled transcriptomes. On average, 53% of unigenes from each taxon match Arabidopsis genes with an e-value of 1.0e-10 or better. An analysis of GO annotations  for these genes shows that the FGP unigene sets provide a remarkably consistent sampling of functional classes defined for the Arabidopsis proteome (Fig. 2). Moreover, similar GO classification frequencies were observed in a subset of 11,974 genes that were found to be expressed at moderate-to-high levels (>100 units) in an Affymetrics microarray analysis of young (stage 3) Arabidopsis inflorescences (Zhang et al. unpublished data). The relative frequencies of ESTs assigned to GO Biological process classes are quite similar across our study taxa. Class frequencies are shown for ten EST sets, the inferred Arabidopsis proteome, and Arabidopsis genes with moderate-to-high expression in young inflorescences (stage 3). Estimation of unigene overlap is inherently error-prone because best BLAST hits are not necessarily orthologs. Moreover, even when orthology is established through formal phylogenetic analysis, similarity in function does not necessarily follow orthology [e.g. ]. We used the PlantTribes database to estimate the overlap among our unigene sets at the gene family level. Unigenes were sorted into the tribes if they have best BLASTX hits to any member of the tribe. Each taxon has unigenes sorted to 19–51% of the 60 tribes that include floral development regulators (Tables 2 and 3). On average, 70% of the gene families represented in one EST set are represented in at least one other EST set. As expected, the most overlap occurs in the largest gene families (Fig. 3). TribeMCL gene clusters (Tribes) with floral development genes vary in size and tend to include similar numbers of rice and Arabidopsis genes (left). These gene families are well represented in our EST sets (right and Tables 2 and 3). *The unigene counts (right) for the CLAVATA gene family have been halved. Among the 100 Arabidopsis floral regulatory genes identified from the literature (Tables 2 and 3), 67 have closely related homologs (best BLAST hit) in at least one FGP EST set. On average, ESTs with a best hit among the 100 listed Arabidopsis flower development genes constitute approximately 1% of each FGP EST set. The average overlap of best hits to these floral regulatory genes was 30.8% between pairs of EST sets. The Amborella, Nuphar and Eschscholzia unigene sets shared three-way overlap in best BLAST hits to six floral development genes (AGAMOUS, AGL6, APETALA3, SEPALLATA1, AXR6, and YABBY3; Table 2) and these species plus Persea shared four-way overlap in best BLAST hits two of these genes (APETALA3 and AXR6). In addition, the FGP ESTs/unigenes were found to match on average 4.5% of the apparent single-gene/taxon tribes (representing putative single-copy genes) from Arabidopsis. The average overlap of these putative single copy genes between two FGP taxa was 28%, and three-way overlap of such genes among the Amborella, Nuphar and Eschscholzia EST sets was 10% (representing 26 genes). The high frequency (66%) of crucial Arabidopsis floral regulators identified in BLAST searches as best hits for sequences in one or more of our EST sets (Tables 2 and 3) indicates that FGP EST sets are a valuable resource for comparative floral developmental studies. For example, identifying homologs of genes being investigated in model systems opens the door to broad cross-species comparative analyses of gene function. Of the 1453 Arabidopsis genes that have recently been identified as having organ-specific expression within developing flowers , 388 (27%) are best BLAST matches to genes from at least one of our unigene sets (e.g. genes in Table 4). We consider this to be a high percentage, given that our cDNA libraries were constructed from a subset of the developmental stages analyzed in the Arabidopsis study . Distribution of best matches to floral organ-specific Arabidopsis genes  among seven unigene sets (species abbreviations as in Table 2). Shown in bold are two DUF642-domain genes with differential expression in petals. Given what is already known about gene duplications in angiosperm history [e.g. [41–43]], the BLAST based measures of overlap are almost certainly underestimates of cross-taxon sampling of orthologous gene sets (including co-orthologs ) represented in our EST sets. Whereas the measures of among-taxa overlap in gene families as defined in the PlantTribe database provide a possible upper bound on the degree of overlap among orthologous sets, simple comparison of best BLAST hits in the Arabidopsis proteome provides a likely lower bound. Formal phylogenetic analyses provide a more accurate assessment of orthologous gene sets. For example, within the MIKC MADS-box gene family, phylogenies uncover greater levels of overlap among our EST sets than were inferred from simple BLAST-based analyses. Of the 12 taxa listed in Table 1, representatives of the DEFICIENS, GLOBOSA, AGAMOUS, FRUITFULL/SQUAMOSA, SEPALLATA, AGL6, and TM8 clades have been identified in 8, 6, 5, 3, 7, 9 and 2 unigene sets, respectively. In addition to providing more accurate estimation of overlap among the transcriptomes being sampled in EST studies, phylogenetic analyses of gene families provide insights into the evolutionary history of genes characterized in model systems. For example, recent phylogenetic surveys of MADS box genes have identified gene duplication events that appear to be associated with the origin and rise of angiosperms and the radiation of core eudicots [e.g., [45–50]]. Phylogenetic analyses of poorly understood gene families can also provide valuable insights into both function and phylogenetic history. For example, two of the 18 genes identified as differentially expressed in petals by Wellmer et al. belong to a single gene family identified in PlantTribes . This gene family includes 10 Arabidopsis genes and 16 rice genes, all containing a plant-specific domain, DUF642 , the function of which is unknown. DUF642 homologs were identified in ESTs sampled from Amborella, Nuphar, Persea, Liriodendron as well as 16 additional plant species included in the TIGR plant gene indices . A phylogeny of these sequences reveals one weakly supported and two well supported subfamilies (Fig. 4). We will refer to these putative subfamilies as clades A, B, and C, respectively (Fig. 4). 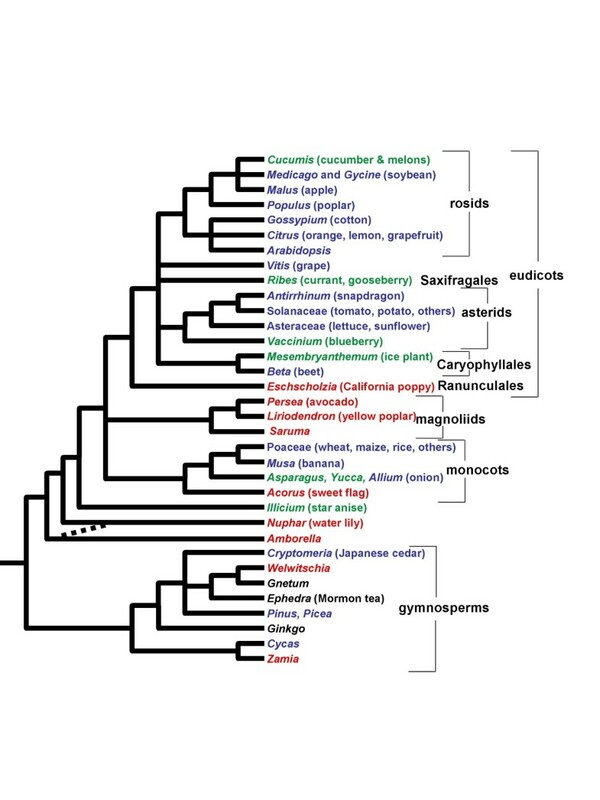 The well supported placement of a gymnosperm gene (from pine) as sister to all angiosperm genes in clade C indicates that the origin of this subfamily predated the common ancestor of angiosperms and gymnosperms. Asterid, rosid and monocot genes can be identified in each of the three subfamilies; magnoliid genes are placed in clades A and B; and the basal-most angiosperms (Amborella and the Nymphaeales) are represented in both clades B and C. The phylogeny suggests that one of the two genes identified by Wellmer et al. is a recent duplicate, the sister gene of which is not differentially expressed in petals. Determining the expression patterns of other DUF642 genes in Arabidopsis, rice, and other plant species and mapping this information onto the phylogeny would be a first step toward understanding their current function and functional evolution. A phylogeny for the DUF642-domain gene family indicates that two Arabidopsis genes with differential expression in petals  are not the products of a recent duplication event. Genes with the plant-specific but functionally uncharacterized domain family DUF642 form three clades (A, B, and C). 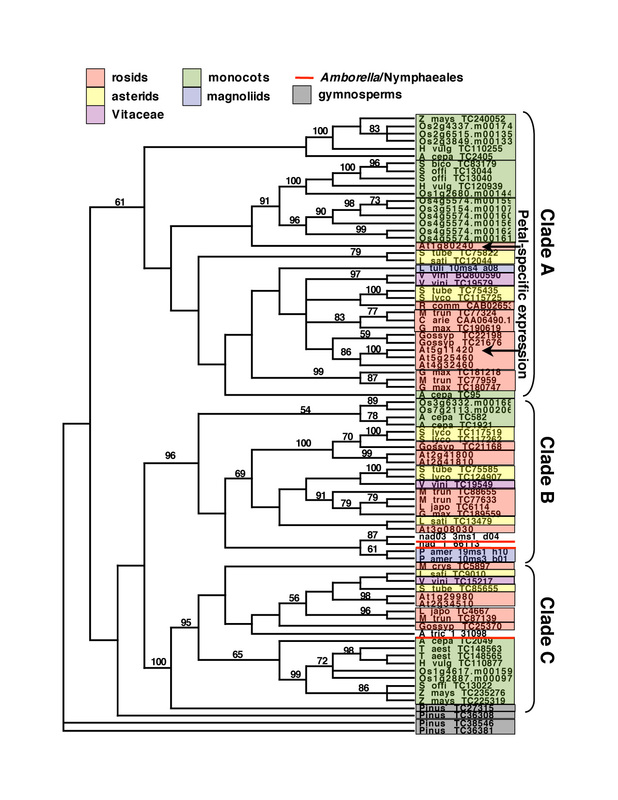 In addition to the Arabidopsis genes with petal-specific expression patterns, Clade A includes asterid, Vitis, monocot and magnoliid genes, indicating that the clade predates the divergence of these lineages (Fig. 1). The genomes of basal-most angiosperm lineages (Amborella and Nymphaeales) and gymnosperms may also contain unsampled Clade A genes. Clade B genes were sampled from Nuphar (Nymphaeales) and Clade C genes were identified from Amborella and Pinus. Bootstrap support values (>50%) are shown above each branch. Abbreviated taxon names associated with some gene sequences: Os, Oryza sativa (rice); At, Arabidopsis thaliana; Gossyp, Gossypium spp. (cotton); G.max, Glycine max (soybean); L.japo, Lotus japonicus; M.trun, Medicago truncatula; V.vini, Vitis vinifera (grape); L.sati Lactuca sativa (lettuce); S.tube, Solanum tuberosum (potato); S.escu, Solanum esculentum (tomato); M.crys, Mesembryanthemum crystallinum (ice plant); A.cepa, Allium cepa (onion); T.aest, Triticum aestivum (wheat); H.vulg, Hordeum vulgare (barley); S.bico, Sorghum bicolor; S.offi Saccharum officinarum (sugarcane); Z.mays, Zea mays (maize); L.tuli, Liriodendron tulipifera (tulip poplar); P.amer, Persea americana (avocado); N.adve Nuphar advena; A.tric, Amborella trichopoda. Relative to the Gene Ontology (GO) functional classification, the FGP is detecting new, translated sequences with astonishing similarity to frequencies known for the entire Arabidopsis transcriptome. These gene discovery frequencies support the preliminary hypothesis that the functional complexity of the floral transcriptome roughly equals that of the global plant transcriptome. This point is supported by a comparison of the predicted Arabidopsis proteome and the collection of genes identified as moderate-to-highly expressed in young Arabidopsis inflorescences (Fig. 2, Zhang et al. unpublished data). Moreover, these detection rates ensure that FGP sequences will be of great interest to the evolutionary biologists for analyses of gene and genome duplications and selection at the molecular level, as well as to the plant molecular biological community in general. For phylogenetics, FGP unigenes assigned to single-gene PlantTribes (such as FRIGIDA and GIGANTEA) could be used to develop nuclear markers spanning all angiosperms. Indeed, further comparative functional analyses of such single-copy genes could be used to test whether natural selection culls duplicates from plant genomes following segmental or genome-wide duplication events. The efficacy of a comparative genomics approach to the discovery of genes involved in floral development is illustrated in an analysis of MIKC-type MADS-box genes. To date, 48 MADS unigenes were identified as likely orthologs to major MADS-box groups, including those of the MIKC-type MADS-box genes that encode well-characterized floral regulators, such as DEFICIENS, GLOBOSA, and AGAMOUS. Further phylogenetic and expression analyses of these newly identified genes from the FGP species promise to yield new insights into the evolution of this gene family critical for flower development. In addition, sequences representing the TM8 clade have been identified in our Amborella and Persea EST sets. The TM8 gene, expressed in developing tomato flower buds, was sequenced at an early point in the study of MADS-box gene function . 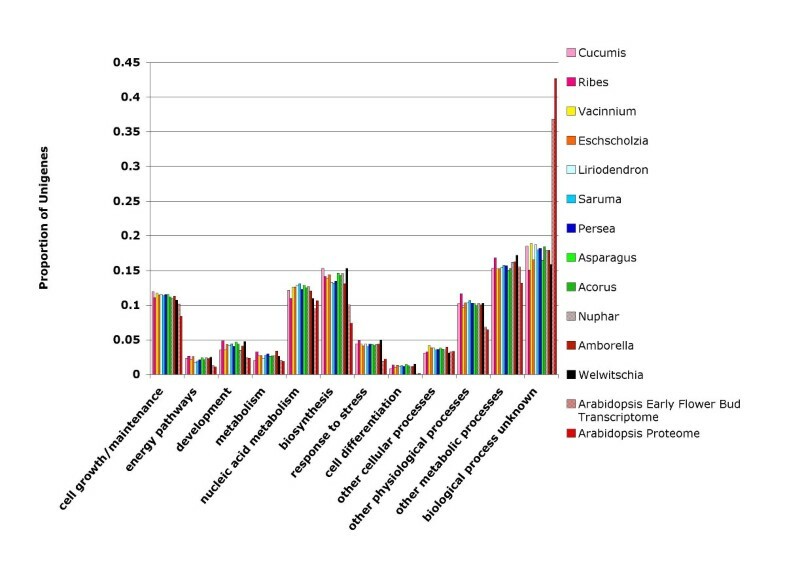 Although a TM8 ortholog, ERAF17, has been associated with female flower development in cucumber , no ortholog of TM8 has been identified within the Arabidopsis or rice genomes, suggesting that it was lost from the genomes of these species. Identification of TM8 orthologs in eudicots suggested that the gene duplication establishing the lineage had at least occurred among ancestral core eudicots . However, phylogenetic placement of Amborella and Persea genes within this clade pushes its origin back to the oldest node in angiosperm phylogeny at least 130 Mya on the basis of fossil evidence [53, 54] and perhaps 145–208 Mya according to molecular estimates [20, 55], suggesting that the TM8-like genes were part of the basic floral "tool-kit" in the earliest angiosperms. Had these new orthologs not been identified, the limited understanding of the functions of TM8 and ERAF17 would have rendered them unlikely targets for candidate gene analyses of basal angiosperms. The high capture rate of known floral development regulators in the MADS-box gene family can be considered a proof-of-concept for the FGP. We expect this frequency to increase for MADS-box and other floral gene families as the size of FGP EST libraries and unigene sets expands. The FGP EST sets described here include sequences from non-normalized nor tissue-subtracted cDNA libraries. As such, many of the genes captured are expressed across many tissues, which could in large part account for the evenly proportioned GO classifications among FGP taxa and the Arabidopsis proteome (Fig. 2). Additionally, our approach to EST collection has limited the discovery of transcripts known to be rare, such as for the SUPERMAN gene . Nonetheless, this limitation can be overcome by either targeted screening of our cDNA libraries or rtPCR. Indeed, primer design for PCR amplification has already been aided by use of alignable sequences observed across multiple FGP EST sets. For example, primer pairs designed from alignments of Amborella and Liriodendron unigenes with Arabidopsis GIGANTEA and rice homologs have been used successfully to amplify unsampled sequences in Nuphar, Acorus, Eschscholzia and Ribes. Although EST sequencing alone will result in incomplete sampling of genes and gene families across taxa, they offer many possibilities for further experimentation and hypothesis testing. For example, EST resources provide the opportunity to derive finished coding sequences that will be more useful for genetic manipulation as well as for comparative bioinformatics. Finished full-length cDNAs can be used as tools for many research endeavors, ranging from promoter isolation to anchoring of shotgun genomic sequences. Whereas incomplete sequences for sampled genes may reduce resolution and accuracy in some phylogenetic analyses, parsimony methods are relatively robust with respect to missing data when taxon sampling is extensive . ESTs and assembled unigenes collected from placeholders for several critical lineages of basal angiosperms are helping to bridge the genomic gap between the eudicot and monocot model plant systems. Initial findings suggest that the basic floral transcriptome, as collected from non-normalized, non-subtractive cDNA libraries, are similar to the inferred Arabidopsis transcriptome in the proportions of its GO functional categories. Moreover, the rates of acquisition of known floral gene homologues among the various basal angiosperm EST sets are high. Finally, in one example of floral gene capture, representation among the ESTs of one lineage of the MADS-box gene family has set the origin of that gene group before the divergence of monocots from basal angiosperms. Together, these results provide strong proofs-of-concept for the Floral Genome Project. We anticipate that these initial findings will afford the opportunity to address a number of conspicuous evolutionary genomic questions, including reproductive organ transcriptome overlap between angiosperms and gymnosperms, genome-wide duplication history, identification of lineage-specific gene duplications and functional divergence, and analyses of adaptive molecular evolution. More generally, plant scientists may use the FGP resources and the comparative method to enhance estimates of sequence/domain conservation as well as hypotheses of function among all of the gene families captured. These resources will also be useful for designing both taxon-specific and universal primer sets for amplification and sequencing of specific genes sampled in one or more of our EST sets. We selected species for analysis (Fig. 1, Table 1) by balancing the following major criteria: (1) phylogenetic position, (2) diversity of floral-organ structure (but absence of highly specialized floral features), (3) direct relevance to crop or economic plants, (4) diploid with a small genome size, (5) availability of inbred lines, when possible, (6) possession of other desirable properties, such as large numbers of flowers per plant, transformability, and having been the focus of prior flower developmental study, (7) non-duplication of ongoing studies of the floral transcriptome – i.e., non-duplication of effort with ongoing studies of model plants (Arabidopsis, tomato, maize, rice, alfalfa, soybean, cotton, etc.). Welwitschia and Zamia are gymnosperms representing the gymnosperm phyla Gnetophyta and Cycadophyta, respectively. Sequence data from these species and a growing number of conifer species are providing insights into the gene family content in the most recent common ancestor of angiosperms and gymnosperms. Amborella, Nuphar (water lily), and Illicium (star anise) represent the most basal clades of extant angiosperms. Saruma, Liriodendron (tulip poplar), and Persea (avocado) represent three different orders of magnoliids. Persea is a valuable fruit crop and Liriodendron is a transformable timber species. Acorus (sweetflag) is sister to all other monocot phylogeny and Eschscholzia (California poppy) is a transformable species representing the basal eudicots. Asparagus, Cucumis (cucumber), Ribes (currant, gooseberry), and Vaccinium (blueberry) are all crop species holding strategic positions in Angiosperm phylogeny. Finally, Mesembryanthemum (ice plant) is a model for the study of Crassulacean Acid Metabolism (CAM) in drought-resistant plants  and represents the Caryophyllales clade of core eudicots. Isolating high quality RNA and building cDNA libraries was particularly challenging for many of the FGP taxa, most of which are non-cultivated. The cDNA libraries from these species were constructed using pre-meiotic immature floral tissues (or reproductive structures in the case of gymnosperms), in order to enrich for early floral regulatory genes important for floral patterning and to prevent heavy representation of the many anther-specific genes that are highly expressed in pollen development. Each library, non-subtractive and non-normalized to be most representative of the floral transcriptome, was made with a signature adaptor-linker sequence to eliminate the possibility of misidentification of clones in the future. Overrepresentation of genes among the libraries was further reduced by sampling mRNA from very young floral buds which have a high diversity of cell types and lack the cells, such as tapetum and pollen, that contain a large number of specific transcripts. Detailed methods used for mRNA extraction, cDNA library construction, and information on library attributes (vector, cloning sites, titer, average insert size, etc.) can be found in Table 1 and on the FGP homepage . A standard sequence analysis pipeline was developed consisting of base calling using PHRED , vector and E. coli sequence contamination screening, and unigene assembly. In addition, a database was developed that also serves as the back end for the Plant Genome Network website . The analysis pipeline and the sequence database are tightly integrated. The quality screen consisted of trimming low-quality sequence, based on PHRED scores, using a custom algorithm. To extend the high-quality sequence as far as possible given a particular quality threshold, the sequence was scanned and, concomitantly, the difference between the quality score and the quality threshold (termed the "adjusted score") was integrated over the length of the sequence. The high-quality sequence was defined as the region of sequence in which the integration of the adjusted score was maximal; this region can include small regions of lower-scoring nucleotides if they are "compensated" by higher-scoring downstream sequence. Next, putative polyA tails were removed if they contained more than 20 consecutive adenine residues. A contamination screen was performed to remove E. coli chromosomal sequences from the dataset. In a final quality screening step, sequences with lengths below a certain threshold (150 bp), sequences with more than 4% ambiguous base calls (Ns), and sequences with a complexity below a given threshold (defined as sequence composed of more than 60% of a given nucleotide) were rejected. The rejected sequences were not used in unigene builds, but were retained in the database along with information as to why they were rejected. Unigene sets were built for each species by combining the sequences from all available libraries for that species. The sequences were first pre-clustered, and these clusters were then assembled using the cap3  program. The cap3 identify parameter was set at 95%. Unigene sequences were also checked for length, complexity and contamination, and chimera detection was performed. The builds were uploaded to the PGN database, where each unigene was assigned a unique unigene ID. Subsequent unigene builds of the same libraries attributed new IDs to all unigenes. Unigenes from a newer build were then tracked to the older builds through the ESTs that they share, and as such, a complete history of unigene IDs is available on the website for tracking unigenes through the different builds. Several strategies were used to get the best possible annotation for the unigene sequences. First, BLAST was used to find the best match for each unigene sequence in the GenBank NR database, and in the complete coding sequences from Arabidopsis . These annotations were stored in the database and serve as the primary source of FGP sequence annotation. To get a better overview for the annotations, we used the Gene Ontology (GO) system [38, 61] to compare the sequence annotations from different species. Gene Ontology is a hierarchical system representing biological knowledge. Many model systems, such as Arabidopsis, are being annotated using GO [38, 61]. The Arabidopsis GO annotations were transferred to each unigene that had a match with an Arabidopsis sequence with an e value less than 10-20. For the comparison of annotations among species, we focused on the biological functional GO category. We selected a number of high-level GO function terms as a GO slim vocabulary, and then mapped the GO annotations to the GO slim terms using the map2slim.pl script provided by the Gene Ontology consortium . Floral Genome Project unigene assemblies and finished cDNAs were regularly subjected to phylogenetically-based classification. The general procedure was as follows: (1) for each PlantTribe of interest, use all Arabidopsis, rice and FGP sequences to search public databases [30, 31, 61] for similar protein coding genes (e < 10-20), (2) machine align all sequences using ClustalW , T-Coffee  or Muscle , (3) manually assess alignment, removing all highly divergent sequences, and then repeat step 2, (4) subject alignment to fast parsimony analysis both with and without branch support estimation [67, 66, 69]. The parsimony phylogeny shown for the DUF642 gene family (Fig. 4) is the strict consensus of 67 equally parsimonious trees estimated for an amino-acid alignment. The parsimony analysis was executed in PAUP*  with 100 random addition replicates and tree bisection-reconnection (TBR) branch swapping. Bootstrap analysis was performed with 250 replicates. The alignment is available in NEXUS format through the FGP website . Two regions of the alignment were deemed questionable and removed from the phylogenetic analysis. This study was funded through the NSF Plant Genome Research Program (project DBI-0115684) and USDA-IFAFS Grant #80388 to Mike Havey for Asparagus EST sequences. The Arabidopsis microarray experiments were supported by a grant from the NSF Plant and Microbial Development Program (IBN-0077832) to H.M. We thank our advisory panel, Ginny Walbot, Elliot Meyerowitz, Rebecca Doerge and Peter Endress for valuable suggestions and encouragement. Sheila Plock and Stephanie Choirean provided valuable technical assistance. We thank Laura Zahn and Hongzhi Kong for assistance in tissue collection. We greatly appreciate the insightful suggestions from Günter Theißen, John Bowers and an anonymous reviewer concerning this manuscript. L.J. Rowland supplied us with the blueberry cDNA library for EST sequencing. VAA, DES, LAM, and JHL-M drafted the manuscript. JEC, WGF, LLL, YH, MB, SK, M-JY, BJB, and XZ acquired most of the data. RP-T and SES made essential contributions to Cucumis and Liriodendron EST library construction. PKW, DCI, TMS, LAM, and JHL-M designed and performed bioinformatic analyses. VAA, DES, JEC, MWF, ST, DGO, PSS, HM, CWD, and JHL-M conceived of the study, participated in its design and coordination, and helped complete the manuscript. All authors read and approved the final manuscript text.